We made it through the first three days, but there is still a LONG way to go! The day after we kicked off our 100 Days of Real Food we were set to host a little party for the neighborhood kids (and their parents). Since it was a field day type event focused on the kids I also provided all of the “kid food”, too. I certainly didn’t want my children to have to eat anything special or different so this meant that all 16 kids (little did they know) would be eating by our new rules! I know I’ve said this before, but I must say it again…thank you popcorn for being a 100% whole-grain! 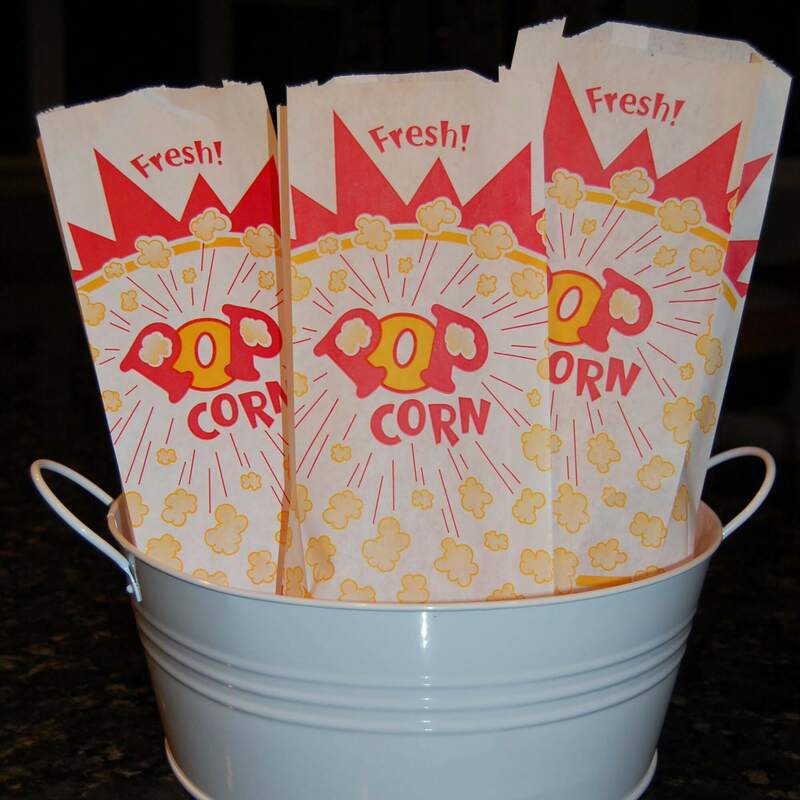 Popcorn is tasty and fun – especially when served in individual little popcorn bags (which I found at World Market). In addition to the popcorn we cut up a big watermelon, which disappeared quite fast. For the main course I knew I wanted to serve hot dogs, but of course they couldn’t be just any hot dogs. I managed to find a local farm that makes hot dogs out of decent cuts of pork and beef, which we picked up at the Charlotte Farmer’s Market. I also special ordered two dozen honey whole-wheat hot dog buns from Great Harvest Bread Company. This was definitely the first time I had ever special ordered anything food related for a bunch of kids….but you gotta do what you gotta do! The adults brought side dishes to share so before the event began I told both of my girls that they were not to eat anything that I wasn’t serving. My 5-year-old got it, but my 3-year-old can’t quite grasp what we are trying to do here. So I must get it off my chest now and admit that my husband said on two occasions he saw our 3-year-old take a bite out of an ever-so-tempting corn chip from the table. He immediately took it away and told her not to eat it, but alas…she may have consumed a small bit! For dessert I served snow cones with juice concentrate instead of syrup. The kids loved the snow cones and had no idea they were simply eating bits of ice squirted with orange and grape juice – the cones were definitely the big hit! So I would say that we mostly survived the cookout, but the next time we attend a backyard party I won’t be the one hosting and controlling the kid food…so it should be interesting! On another note, we started off our morning today with my 5-year-old requesting my grandmother’s crepes for breakfast. I was pleasantly surprised that my grandma’s recipe worked out beautifully with me substituting the flour for whole-wheat flour and the tablespoon of sugar with honey. Both of my girls loved them and kept asking for more. Life is good when you can eat something this good and have it be guilt-free!! Kudos to you & your family! I’m hooked on your blog and actually own a copy of “In Defense of Food” by Michael Polan. I enjoy your real life experiences and what someone else referred to as your cliff’s notes summary of the book. Keep up the great work! Oh, and will you be posting a recipe for the crepes? They look amazing! Thank you for your kind words Sherri! It is wonderful to know that what I am doing might be helping others. And I will definitely add the crepe recipe to my list of things to post! 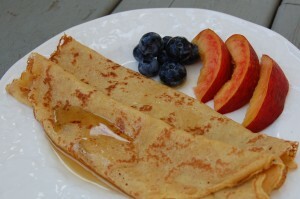 We make crepes with whole wheat and LOVE them! So many great options! I’m devouring your blog! All I want to say is I hope your popcorn was organic. It IS a great snack food, but popcorn as well as soy is one of the MOST GMO’d food sources. I have given up my beloved corn until I can find some pure kind (I am eating imported polenta at the moment). LOVE this website! I am just getting started reading it. I read the crepe recipe page but I am having trouble figuring out if there is a filling inside these or not. Are they just as yummy without filling? Super excited to try them! This gives me hope. I have been trying to convert my family but as far as we have come, when we had my brother’s graduation party (and any other company-coming affair) my parents felt that the organic and healthy versions were not appropriate, more expensive, and people would feel like we are imposing our new diet. I don’t want to go to a party and be forced to eat white bread with my burger! It is refreshing that you kept to this even with company that might not have the same food philosophy as you – yet.